But I just wanted to mention something for the folks out there who enjoy reading my writing (both of you!) and let you know that you can also read my writing elsewhere. 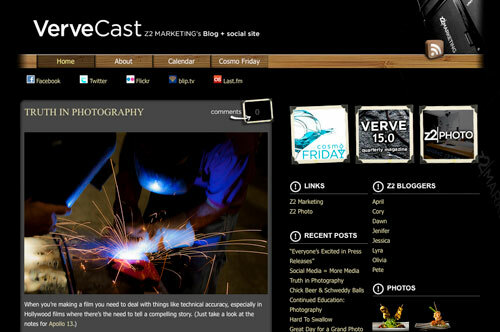 I post over on the VerveCast blog, which is published by Z2 Marketing. I usually post about once a week. You can certainly just see my posts, but I’d encourage you to check out the other authors as well. We’re a branding firm, but I often delve off into subjects like 3D printers, desktop manufacturing(? ), experts, and weird photos. Since those guys (and girls!) 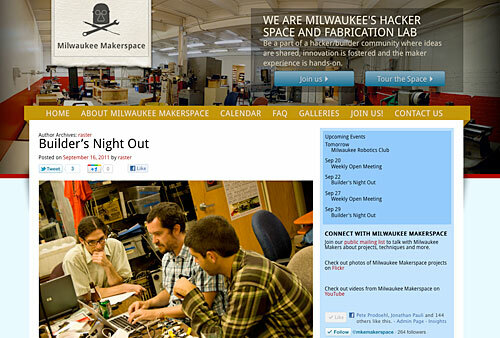 at the Milwaukee Makerspace were kind enough to let me join and hang out there, I’ve also started blogging over there. I often post about my own weird projects, but I also try to post about interesting topics, demos we do, or just a typical night of hacking and making. And if all that isn’t enough (and it should be!) you can occasionally see mysterious images over on Posterous, or see the strange things I post on Google+. I’ve had at least one person say “Hey Pete! I thought you didn’t like Google?” and if I can clarify, there are things about Google I don’t like, just as there are things about Apple I don’t like, and (many) things about Facebook I don’t like, and throughout my travels in the tech world, I’ve been lucky that I haven’t worked for any of these companies, so I can feel free to speak about the things I don’t like. Don’t get me wrong, there are a lot of things about Google, and Apple, and Facebook that are good, but I try to be critical, and not give any company a free pass. With that said, I am definitely a fan of Google+ so far, and as far as being better than Facebook? Well, in many ways it is better for me, while in some ways it still needs to catch up. I’m glad there’s an alternative for sharing and collaboration now with more features that seem to be interesting to makers. 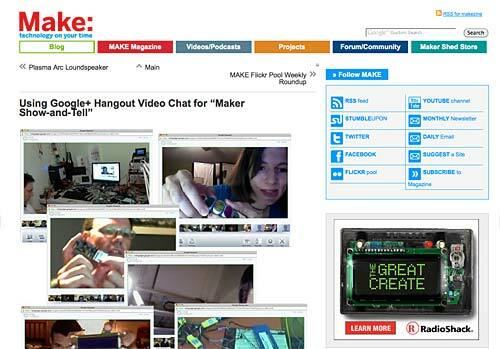 Historically Facebook hasn’t done much in the Maker community, I’ve tried to get them to participate in Maker Faire each year (and would still love to have them, there are a lot great ideas for Facebook + Maker Faire). While it would be impossible to be a fan of everything Google does, they’ve been part of Maker Faire many many times, they’re doing a Science Fair, they have a hacker space for employees, they’ve adopted Arduino for Android, lots of good OSS efforts and the tools they’re creating with more control and ownership seems to fit the maker mindset better – it does feel like they’re listening, I hope they keep it up. Phillip sums it up pretty well. Google may not do everything right, and they may still do things I don’t agree with…. but at the end of the day, they’re probably doing a lot more for maker culture than Facebook is, and that counts for something in my book. Recently while doing a Google+ Hangout, I put one of my puppets in front of my camera for a while and thought nothing of it. But then… inspiration struck! A hangout consisting of nothing but puppets! I thought this was the perfect excuse for people who had excuses about being uncomfortable on camera. I mean, to some degree we are all hiding behind our keyboards when we post online, but with video… bam! It’s your face, right there, nothing to hide behind. That makes some people uncomfortable… send in the puppets! 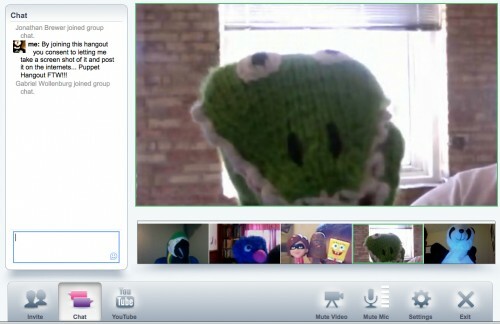 So thus was born the first Google+ Puppet Hangout. By joining this hangout you consent to letting me take a screen shot of it and post it on the internets… Puppet Hangout FTW!!! One weird thing was, when we got up to five people, I started to forget who was who, which was really interesting. Oh, I know there’s been great debate over store-bought vs. hand-made puppets, but I say anything goes. And as for silly voices? Encouraged! Go forth now people, and let a thousand Puppet Hangouts bloom!